When you are looking for a pet who doesn't shed, the turtle is one to consider. Sulcata tortoises and Russian turtles are two popular but quite different options. Although these pets are relatively low-maintenance, they require a suitable habitat and quality food and care. Before deciding which one to bring home, consider their differences to determine which species best fits your circumstances. Sulcata tortoises originated in the hot, dry climate of Northern Africa and are native to countries such as Senegal, Niger and Ethiopia. These tortoises evolved to utilize water efficiently to survive in dry climate and dig burrows to escape the heat. Russian turtles are named for their origins in Russia; they're also found in Afghanistan, Pakistan, Iran and China. They live in arid habitats ranging from the sandy steppes to arid and rocky hills. Sulcata tortoises are much larger than Russian turtles. The third largest tortoise species, sulcatas may be 24 to 30 inches long and 80 to 110 pounds. Russian turtles are much smaller, males measuring only 6 to 8 inches long. Females are slightly larger, growing 8 to 10 inches in length. Sulcata tortoises do not hibernate; in captivity they must have a warm, dry environment year-round. Ideally, nighttime temperature should be in the 70s Fahrenheit. 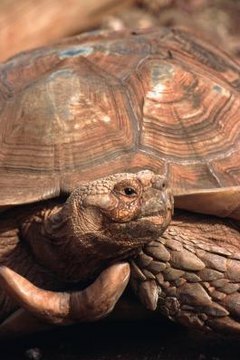 If you live in a cold or wet environment, be sure to provide an indoor enclosure to allow the tortoise to stay warm. Wild Russian turtles hibernate up to nine months a year. They do not need to hibernate in captivity if their enclosure is kept warm. Many owners, especially those living in colder climates, choose to hibernate their turtles by placing them in a cool enclosure, ideally 39 to 41 degrees Fahrenheit. Sulcata tortoises must have a large enclosure for roaming around. Due to their large size, indoor housing is not recommended for adult sulcatas. The temperature in the habitat should be between 85 and 105 degrees Fahrenheit during the day and into the 70s at night. Sulcatas do not swim, so provide water in a shallow tub. Russian turtles are more easily kept indoors due to their smaller size, but they still need a large enclosure to move around in. If kept outdoors, their enclosure must be safe from predators such as raccoons. Russian turtles live at a cooler temperature than sulcatas. Ideal daytime temperature should be between 70 and 80 degrees Fahrenheit, nighttime temperatures 60 to 65 degrees. Provide your turtle with a basking area at approximately 95 degrees. Can I Put a Hermit Crab With a Sulcata Turtle?